I have a thing for crunch. Texturally speaking, with every meal I eat I crave the crunch. It probably explains why I am such a lover of nuts and popcorn and find excuses to weave them into as many Chew Town recipes as possible. When tasked with making a cake recently for a friend’s afternoon tea baby shower, I knew a crunchy cake was in order, and what better than a streuselkuchen (streusel cake). A streuselkuchen is a traditional German cake which is normally a lot flatter than my version and baked in a rectangular dish with about 50% cake and 50% crumb topping (the streusel). The topping is a mixture of sugar, fat and flour (at a ratio of 1:1:2) which results in a crunchy topping (I couldn’t resist adding nuts to mine of course). The contrast of the super moist cake with the streusel topping is simply wonderful and perfect for afternoon tea. 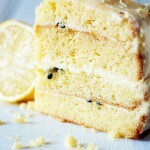 This version includes fresh coffee which contributes to the cakes lovely moisture. It’s not overly coffee flavoured because I have a complete aversion to instant coffee and so avoid using it where possible – that’s definitely my Italian heritage coming to the fore. Ever the showman, the original flat version just didn’t have the wow-factor I was after, so I went against tradition and baked mine in a springform ring pan and topped it with a glaze drizzle. I do hope you enjoy it as much as we did eating it! The recipe is listed below. Now, don’t be scared by the ingredient list – the results are worth it! Basically the recipe ingredients are broken down into 3 sections – Cake, Streusel Topping and finally the glaze. Enjoy! Prepare the streusel topping by mixing together the flour, sugar, caramel cinnamon sugar (or ground cinnamon) and salt. Add the cold butter pieces and cream cheese, and rub in with your fingers until small clumps form. Add the macadamias, hazelnuts and pistachios and place in the fridge until required. For the cake, butter a 23cm round tube pan and set aside. Into a bowl sift together plain flour, baking powder, bicarbonate of soda and salt. In a separate bowl, cream together the butter and sugar until pale and fluffy (4-5 minutes). Gradually add the eggs one at a time beating between additions, then add the vanilla seeds and coffee and beat until combined. Beat in the flour 1/3 at a time and alternative with the buttermilk, beginning and ending with the flour mixture. Pour the mixture into the prepared pan and spread until even. Then sprinkle over the streusel topping evenly (there is a lot of it, but be sure to add the whole lot) and place in the oven to bake for about 55 minutes, or until the top is golden and a skewer comes out clean when inserted. that looks fricken amazing. i want it so badly it hurts. Could you please tell me how much each shot of coffee weights as my coffee machine varies sometimes. Many thanks – your cake looks superb and I’ll definitely be making one soon! Hi Lyndsay, thanks for your message. I actually wondered if I was being too vague and I was right! I measure each shot of coffee to be 40ml each. The springform pan was a good idea — I really like the looks of this. Love the topping! Thanks for this. well a cake has to look good and taste great too! love this cake, so pretty! Oh I love the drizzly icing over the streusel top, delicious. o snap – I too am all about the crunch. This cake looks perfectly decadent. Oh my lord, look at that cake. It is stunning. Kriiiise! Durch deinen Blog sind jetzt noch zig Rezept auf meine “Nachbackliste” dazugekommen 🙂 Suuper schöne Fotos, lecker aussehender Kuchen! I bake a walnut and raisin streusel cake and love it! Definitely going to try the this coffee one! I have a springform pan but no ring. Could I use an empty aluminum can for the center?? Hi Elaine, You could bake it in a normal springform pan without the ring. It might just need a little longer in the oven. Bake it until a skewer inserted in the centre comes out clean.